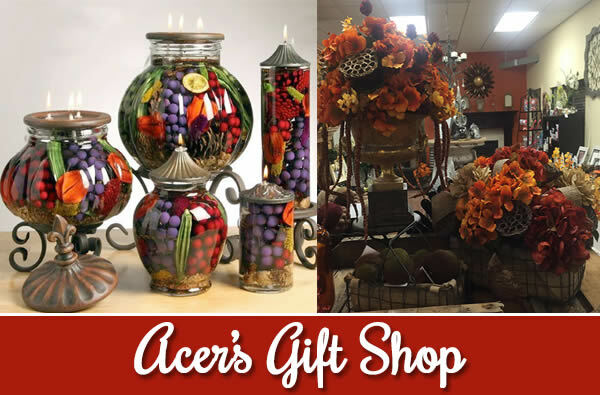 The Gift Shop at Acer's carries a Full of Range Unique Gifts, including Custom Silk Arrangements, Lifetime Candles, and Gardening Accessories. 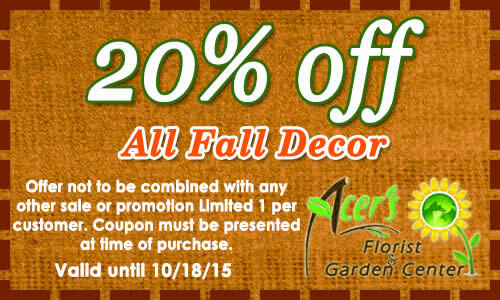 We also have a Full Line of Seasonal Decor that will have your home radiating the spirit of Autumn. Cut back perennials and rake area around them; leaving diseased or insect-laden foliage can cause problems next year. Weed all areas and dispose of them in the trash (not the compost pile) to discourage weeds in the future. When your annual plants have died back remove them. Add compost, manure, lime and gypsum to the bed to enrich the soil for next year. Edge the grass along planting beds--one less thing to do next spring! Plant early-spring flowering bulbs. Plant them in groupings instead of rows; not only does it look more natural, but they will be less susceptible to wind damage. Remove all faded flowers from plants like roses and hydrangeas, rake up all leaves and tie up the branches. This will help protect your plants from snow damage. Thin out about 1/3 of the oldest branches of flowering shrubs like forsythia, lilac, spiraea and potentilla to promote better bloom and a nicer shape next spring. 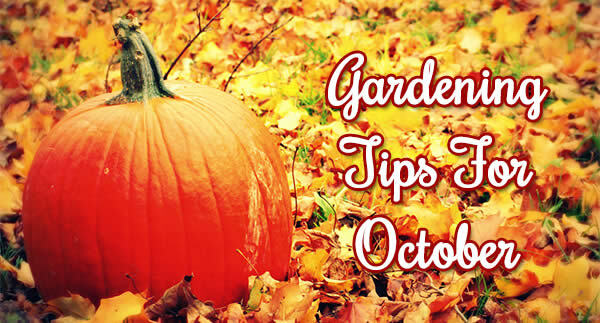 Dig up tender bulbs, tubers and corms such as dahlias, canna lilies, caladium and gladiolus. It’s a good idea to label them as to type, color and height to make your life easier when replanting them next spring. 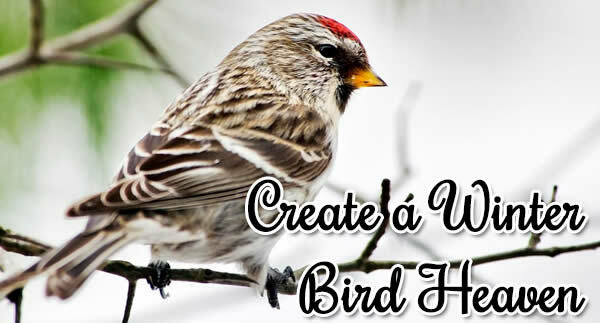 Sprinkle them with a rose and flower garden dust to discourage insects. Store them where they will not freeze in paper bags or boxes. Collect leaves to shred and add to the compost pile (if you don’t already have a pile, now is a great time to start one). Work weed-free steer manure or compost into asparagus beds. 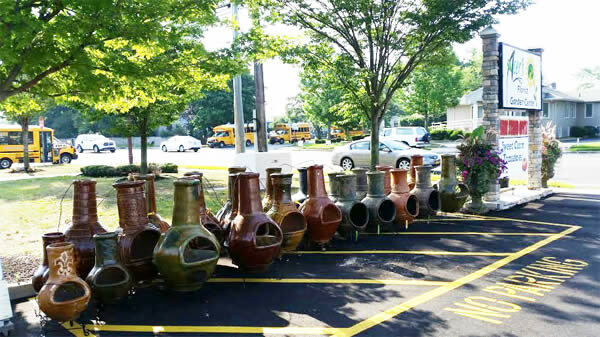 Clean birdbaths, fountains and clay and ceramic pots and move them to a protected place for the winter. Move any garden statuary, garden signs and other patio decorations to a protected place for the winter. Clean out your vegetable garden, disposing of all plants, weeds and old veggies. For a great source of organic material next spring, plant winter rye in the cleaned vegetable garden. In April, simply cut the grass then till the remaining grass and roots into the soil! Start some pots of paper white narcissus for holiday forcing. They make great hostess gifts! Fertilize the lawn one last time to prepare it for the upcoming winter. If you are decorating with pumpkins, rub a little Vicks on them--this keeps the squirrels and chipmunks from feasting on them. Indian corn used as fall decorations can be protected from blue jays by simply spraying with shellac or hair spray. Drain hoses of water, coil them and tie them together to prevent them from being filled with ice. Pumpkins are thought to have originated in the ancient Americas, although the pumpkins of that time would probably not be recognizable as such today. Related to squash, gourds and melons, the early pumpkin had a crooked neck and was particularly valued because it stored well. Archeological digs have shown that pumpkins were cultivated by Native Americans along river and creek banks along with sunflowers and beans. Pumpkins helped sustain Native Americans through many a long, cold winter. They prepared the sweet flesh in a variety of ways including roasting, baking, parching, boiling and drying. But the flesh was not the only part of the fruit that was used; the blossoms were added to stews and pumpkin seeds were consumed and also used for medicinal purposes. In addition, dried pumpkin was often ground into flour. The pumpkin was used for non-food purposes as well. The shells were dried and used as bowls and containers in which to store grain, beans and seeds. Dried pumpkin flesh was also pounded thin and cut into strips, which were then woven into mats that were later used for trading. Christopher Columbus encountered the pumpkin when he visited America. He transported some seeds back to Europe with him. The seeds were used to feed pigs, but not as a human food source at that time. 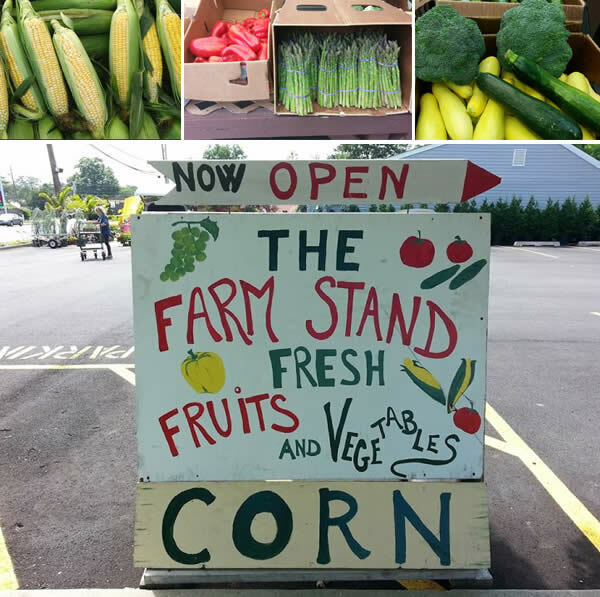 Most of us are aware of the story of how the Native Americans introduced the Pilgrims to many local foods which helped sustain them through the subsequent - sometimes brutal - winters. 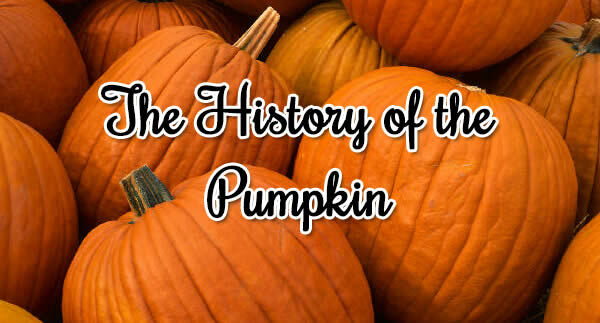 Pumpkins were one of these foods; they proved a valuable resource because of their ability to be stored for long periods of time without spoiling. Pumpkins were served at the second Thanksgiving celebration, but not in the pie form so popular today. The Pilgrims cut off the top of the pumpkin, scooped the seeds out and filled the cavity with cream, honey, eggs and spices. The top was then replaced and the pumpkin was buried in the ashes of a cooking fire. The custard-like contents were then eaten along with the cooked flesh. Another popular Pilgrim recipe was pumpkin beer, which was a fermented concoction of persimmons, hops, maple sugar and pumpkin. The hollowed out shell of the pumpkin was used as a template for Pilgrim haircuts. As a result of this practice, New Englanders were sometimes called "pumpkinheads." Today, one of the primary uses for pumpkins is as carved jack-o'-lanterns during Halloween. It was not always so. The earliest jack-o'-lanterns were carved from turnips and potatoes (by the Irish and Scottish) and beets (by the English). Lumps of coal were lit on fire and placed inside the hollowed-out vegetables. When European settlers came to America, they found a new favorite for this practice--the pumpkin. Pumpkins proved far superior to their earlier counterparts by virtue of their strong walls and large hollow cavity. Today, pumpkins are available in all colors and sizes, further expanding their uses as a decorative element as well as a food source. 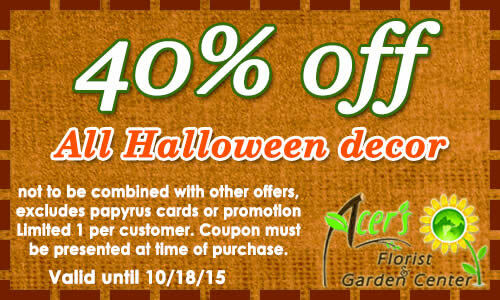 From miniatures to huge specimens, there is a pumpkin to fit every need. Line a 9-inch pie plate with pastry; flute edges. In a bowl, combine the apples, butter, sour cream, lemon juice, sugar, flour, cinnamon and nutmeg. For topping, combine flour and sugar in a bowl; cut in butter until mixture resembles coarse crumbs. Bake at 375° F for 45-50 minutes or until the filling is bubbly and the apples are tender.